Some nouns you can touch, like a baseball. Some you can’t, like freedom. 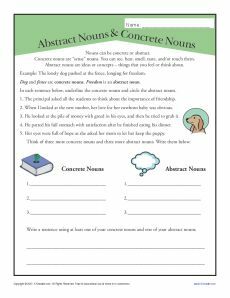 Here’s a worksheet for your student to practice identifying abstract nouns and concrete nouns. It’s a great way to practice 3rd grade Conventions of Standard English for Common Core Standards. You may also use it for other grades as needed.